Prajñā (Sanskrit; Pali: paññā; Tibetan: shes rab, Chinese: 般若, buo re) meaning «wisdom,» «cognitive acuity;» or «know-how» — but especially the Buddhist wisdom that is based on a realization of dependent origination, not-self, emptiness, etc. Prajñā is the wisdom that is able to extinguish afflictions and bring about enlightenment. 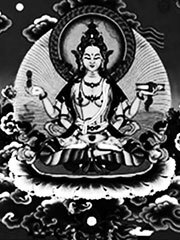 The Prajñā-pāramitā Sutras, such as the Heart Sutra, describe it as supreme, highest, incomparable, unequalled, and unsurpassed. It is spoken of as the principal means, by its enlightenment, of attaining nirvana, through its revelation of the true nature of all things. Prajñā is also listed as the sixth of the six paramitas. The beginning of the Heart Sutra includes the phrase «..doing Prajñā..» indicating that prajñā is also an activity as well as an outcome, quality or state. As activity, prajñā can be described as «choiceless engagement» where «choiceless» means selflessly accepting outcomes as they develop, followed by further engagement. In the history of Zen Buddhism, the Sixth Patriarch Hui-neng (d. 713) emphasized the practice of prajñā in counterpoint to the quietistic and self-absorbed style of meditation that was then current. In so doing, he emphasized dynamic action and human involvement as essential to Zen practice.